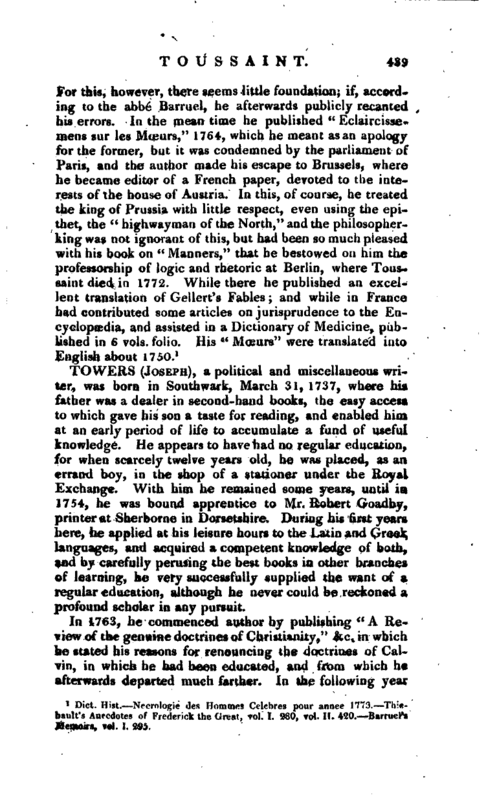 , a political and miscellaneous writer, was born in Southwark, March 31, 1737, where his father was a dealer in second-hand books, the easy access to which gave his son a taste for reading, and enabled him at an early period of life to accumulate a fund of useful knowledge. He appears to have had no regular education, for when scarcely twelve years old, he was placed, as an errand boy, in the shop of a stationer under the Royal Exchange. With him he remained some years, until in 3754, he was bound apprentice to Mr. Robert Goadby, printer at Sherborne in Dorsetshire. During his first years here, he applied at his leisure hours to the Latin and Greek languages, and acquired a competent knowledge of both, and by carefully perusing the best books in other branches of learning, he very successfully supplied the want of a regular education, although he never could be reckoned a profound scholar in any pursuit. In 1763, he commenced author by publishing “A Review of the genuine doctrines of Christianity,” &c. in which he stated his reasons for renouncing the doctrines of Calvin, in which he had been educated, and from which he afterwards departed much farther. In the following year | he left Sherborne, came to London, and having taken out his freedom, supported himself by working as a journeyman printer; and having long before this turned his attention to political, as well as religious subjects, he published a pamphlet on libels, which Wilkes and his party had then rendered an interesting topic. In 1765, his late master, Mr. Robert Goadby, formed the design of publishing, periodically, the lives of eminent men of the English series, and employed Mr. Towers as the editor. The first volume appeared accordingly in 1766, 8vo, under the title of “British Biography,” and was continued by him as far as the seventh volume. The remaining three were written by a clergyman in the west of England. This, although the lease known, is by far the best of Mr. Towers’s works. The compilation is every where judicious; his principal authority, indeed, is the “Biographia Britannica,” but he evidently consulted original authorities, studied much among the treasures of the British Museum, and produced a work certainly very creditable to his talents and judgment. 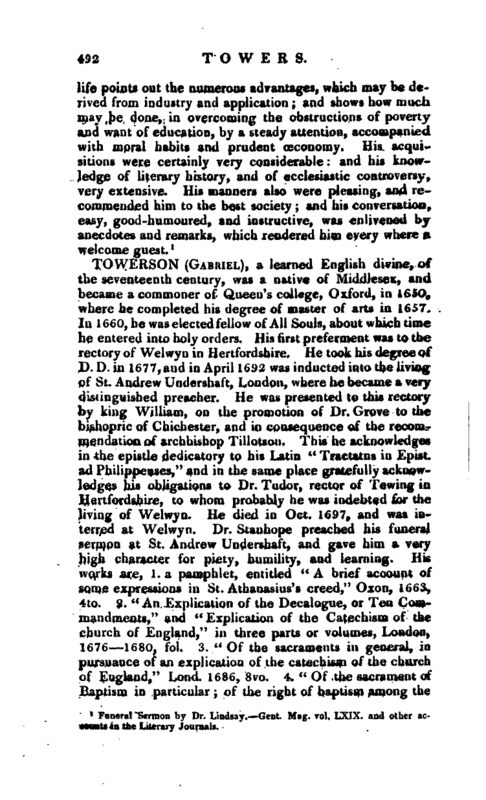 He was also at this time far more free from political prejudices than when he became a coadjutor of Dr. Kippis’s in the new edition of the “Biographia Britannica.” As his name, however, was not prefixed to the “British Biography,” he derived no fame from it, although it served to recommend him to his employers. About this time he acquired some property by marriage, and laid it out partly in furnishing a bookseller’s shop in Fore-street. Here he carried on trade for about nine years, but with no great success. During this time he published various pamphlets on the political topics of the day, and always in opposition to the measures and supporters of administration. In 1774 he resigned his business, and was ordained a preacher among the dissenters, and soon after chosen pastor of a congregation at Highgate. In 1778 he exchanged this situation for the office of forenoon preacher at Newington Green, where Dr. Price preached in the afternoon. When Dr. Kippis was employed by the London booksellers on a new edition of the “Biographia Britannica,” he recommended Mr. Towers as his assistant; and he wrote several lives, but, as already noticed, under the influence of prejudices which did no credit to the work. It seems indeed rather surprising that a work in which the lives of the eminent men of the church of England must necessarily be expected to form a large, | if not the largest share, should be entrusted to one who had no sympathy with the constitution or doctrines of that church, and who, while he probably exerted as much impartiality as he was capable of, could not, in the nature of things, divest himself of a degree of prejudice which must damp his praise, if it did not dispose him to censure. In 1779, he received the degree of LL. D. from the university of Edinburgh, and continued occasionally to communicate his sentiments on public affairs in various pamphlets, of which it may be sufficient to give a list. In 1796 he published by subscription a collection of them in 3 vols. 8vo, containing, vol. I. “A Vindication of the Political opinions of Mr. Locke.” “A Letter to Dr. Samuel Johnson,” and “Observations on Mr. Hume’s History of England.” Vol. II. “Observations on the Rights and Duties of Juries.” “A Letter to Dr. Nowell.” “An Examination of the Charges brought against lord Russell and Algernon Sidney.” tc A Dialogue between two gentlemen, concerning the application to Parliament for Relief in the matter of Subscription, &c.“”A Review of the genuine doctrines of Christianity,“and an” Oration delivered at the interment of Dr. Caleb Fleming.“Vol. Ill,” Thoughts on the commencement of a new Parliament.“”A Dialogue between an Associator, and a well-informed Englishman“” Remarks on the conduct, principles, and publications of the Crown and Anchor Association.“”And an Essay on the Life, &c. of Dr. Samuel Johnson." His religious opinions, respecting the doctrine of the Trinity, are said to have been those of Dr. Samuel Clarke; with a more moderate degree of Arianism; and although he associated much with the zealous advocates for Unitarian principles, he expressed no doubts of the pre-existence of Christ; nor did he become a convert to their notions respecting materialism, or what is called philosophical necessity. He was disposed to think that, whatever might be the means of meliorating the hardened and wicked in another state, the whole human race would ultimately have reason to acknowledge, that their existence was a blessing bestowed by the father of mercies. 1 Funeral Sermon by Dr. Lindsay. —Gent. Mag. vol. LXIX. and other accounts in the Literary Journals.